The hymn Precious Memories was written by J. B. F. Wright. As a child I remember hearing my dad listen to Jim Reeves, Tennessee Ernie Ford, and others sing this song on the record player. While in college, at Lubbock Christian, we gave Dr. K. C. Moser an organ when he retired. As he thanked the students in chapel, he stated that when he got it home, Precious Memories would be the first song he played. What makes them precious? There are memories that some try to wipe out of their head. Those memories are painful and hurt to remember. But, precious memories are the ones that we want to hold and keep in our hearts. I first met Ms. Jackson when she sang for Mr. Baker’s retirement. It was at Wester School, and she tore it up! I loved her voice and she was an accomplished pianist. Forward a few years, and Ms. Jackson was at Estacado High School and I was teaching at Honey. Hoot’s Bagels had opened and we both stopped by the store on our way to work. I saw this beautiful Cadillac (I have always wanted one, especially an El Dorado), and getting out of the car was Ms. Jackson. We would see each other quite often, because loved those bagels. But, what I loved more were the morning visits with her. She would make me laugh. Forward a few more years, when I was Coordinator for GT and the Northwest Regional Director for Destination Imagination I would see her at Estacado High School home of the Matadors. The city and regional meets were held at EHS. One year we had to use her choir room. I have no words. It was exciting, but I can’t describe it. After the tournament something was missing, and I don’t know how she knew because it was a mess. Eventually, she discovered that it was not missing but had been moved. We laughed and then she blamed the students. Advance a few more years, and I became principal at Parkway. Ms. Barbara would bring her EHS students to carol at Christmas time. I was so impressed as to how she was able to get so many young men to participate in choir. These Matadors loved singing with her and they would perform to excellence. So, my heart was thrilled when I heard that Ms. Jackson was moving to Parkway to be my music teacher. I was so excited. Ms. Barbara could get anyone to do anything. 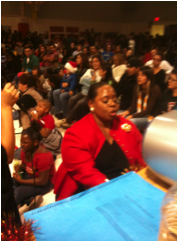 I remember the year I asked her to do a Christmas program and she used students in every grade level. I was sweating, as it didn’t seem to be too organized (kind of like the room situation mentioned above). She said, “Mr. Fitz, don’t you worry.” It was one of best programs ever and the gym was packed. As stated earlier, she could get anyone to do anything! She had asked if I would play Santa Claus - because the children would love. I told her that I wouldn’t. As I write this, tears fill my eyes, because I donned a Santa suit for Ms. Jackson. There were some days that were burdened with problems and stress that are just part of educating children. I would amble down to her room and ask her to play a hymn for me. She not only played but “SANG.” She was able to sight-read music on the spot and error free. But Ms. Jackson could also tear it up when filled with the Spirit. The children loved her. She worked to help our kids and would tell them things that they might not want to hear. But, she was candid, well blunt, but in a kind-hearted way. I would be in my office working and during her lunchtime would stop and visit. I am sure that Mrs. Shantell Turner remembers those visits. Those are memories that I will cherish forever. One night she invited me to a musical at her church in Levelland. That is where I met Mr. Jones. She was so in love with him and the next day she told me he would eventually be her husband. He did, like I stated earlier Ms. Jackson could get anyone to do anything. My words do not adequately describe our relationship. It’s one that I will always cherish and even though she married Mr. Jones, I will always love her. These are my precious memories of Mrs. Barbara Watson Jones! Holy, Righteous, and Eternal Father thank you for the blessings that you give us each day. Thank you for the people you put in our lives. LORD, may we not take them for granted. May we be kind and generous to all – building relationships and memories with them. I pray that we lead a life that is righteous so that the memories we leave may be a blessing to others. Father, help us to be obedient to your Word. Thank you for Jesus Christ, the One that makes it possible for us to have a relationship with you, our God. Amen. Sent from somewhere to my soul. And the sacred past unfolds. In the stillness of the midnight. Echoes from the past I hear. From that lovely land somewhere. I know not what the years may hold. Father in heaven, I humbly ask that the family of Mrs. Barbara feel your comfort and presence during this time of loss. My Hairless Chihuahua died on Saturday the 10th of November 2012. Her name was Cosita, which means “little thing” in Spanish. We called her Tuter. She was a tiny dog weighing only 5.4 pounds. As a puppy she was unable to feed from her mother and never developed to the size of her sister, Frieda. The sisters had never been separated and Frieda’s death in 2010 was hard on Tuter. Although small, Tuter was the Alpha dog. She was feisty and in charge. My sister-in-law rescued the girls from horrific living conditions. They were covered in ticks and sick. The sisters went from the barrio to a huge walk in closet at my brother’s house. They would stay in there and come out for food, water, and bodily functions. My sister-in-law called them the Closet Fairies. Tuter was so scared and skittish. The abuse and mistreatment that she faced before the rescue lasted a lifetime. As Tuter grew she had problems with her teeth. The veterinarian wanted to remove them, but my brother stated he didn’t want it done. After much discussion, the vet removed her teeth as well as a portion of her bottom jaw. Tuter recovered. In 2009, Frieda had gone blind and while outside fell into the pond. My brother was going on a trip and asked if I would watch the girls for a month. I brought them home to Lubbock and they never left. After Frieda died, Tuter and I bonded. She had trouble eating so I would made sure her food was ground up, she had plenty of water, warm blankets, and clothes. She was Queen of my house. Treated like royalty until her death this November! Although, I had never mistreated her she always remained skittish and be on guard. She loved to snuggle and we would spend more hours with me because I was retired. She felt the need to remain cautious. I don’t know what abuse she faced as a puppy but it lasted a lifetime. This caused me to wonder about children that have been mistreated at an early age – do they ever get over it? 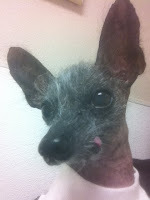 Tuter was hairless, part of her bottom lip missing, tongue hanging, and covered with tumors. Yet, she was a very loving dog. It made me think how quickly we judge others on their appearance and not looking at the heart. Tuter was not the prettiest but she was the sweetest and I learned a great deal from her – not to judge people by appearance, take care of children that have been mistreated, and pray for those adults that have not learned to trust. Especially trusting the God that created and loves them! Brought her ashes home today. She is back with Tio Ween and still Queen of my house. Thanks Tuter – I hope you know Ween loves you…..
I’ve always loved to sing. As a child, I would go in my room and close the door (thinking no one would hear) and open up the church songbook. After a few practice rounds I would call my grandmother and sing to her. Recently I thought about how heavy her phone receiver must have weighed. I would sing to her and she would listen – or at least I thought she was. After contemplating the weight of the phone I’m sure she laid it down, picked it up to see if I was still singing and tell me what a great job I did. Now with that background I thought that I would write a prayer using song titles to express gratitude for what our God and His Son and our Savior did for us as we celebrate this Easter. Italicized words are songs or lyrics of songs. Father in Heaven how we love you and we praise thee, O God. Father, hear the prayer we offer for you are Holy, Holy, Holy. You are the Father of mercies and great is your faithfulness. Blessed be the Lord God Almighty, a mighty fortress is our God. We Praise thee oh God for our God he is alive. How great thou Art! It is because of your amazing grace and the wonderful grace of Jesus that we can say His grace reaches me. Lord we come before thee now and at thy feet we humbly bow. It is on bended knee we enter your presence. Dear Lord and Father of all mankind forgive our foolish ways. It was love divine that sent your son to die on the cross of Calvary. Jesus our Lord and Savior thank you saving us! Jesus, thy name I love. Jesus, name above all names. Jesus, our redeemer the fairest Lord Jesus! You gave your life on the old rugged cross. When I survey the cross, and am beneath the cross of Jesus, I realize that Jesus paid it all. It was boundless love that allows me to say that I’m redeemed. He could have called ten thousand angels but He bore it all. He paid a debt and my sins are nailed to the cross. Hallelujah what a Savior! For it was low in the grave He lay. The good news is that Christ the Lord is risen today. He lives and because He lives there is victory in Jesus. There is power in the blood of the Lamb. A wonderful savior is Jesus my Lord. Why did my Savior come to earth? Because, Jesus loves me this I know. It was in loving kindness that Jesus came and I am safe in the arms of Jesus. I can say it is well with my soul. I have blessed assurance because of Jesus. Jesus, you are my all in all. You are a wonderful Savior and I will sing the wondrous story to tell others that I know that my Redeemer lives. Oh nobody fills my heart like Jesus. Jesus I long to be with you and pray that soon and very soon we are going to see the King. Oh How I Love Jesus and it is his name I pray this prayer. We had Pajama Day? Yes, pajamas were the choice of attire for the Broadway Sonshine PreSchool. Just so you will continue reading let it be known that I chose not to participate. Actually it was a great idea. The children in the 4s were studying the letter P and the two just seemed to go together. Polo, Hilfiger, Lucky Brand, Guess, Ecko, Nike, Young Jeezy, Uggs, and the list can go on and on. I never wanted to be a walking advertisement for name brands. But for some it is imperative that the clothes have the correct logo. When doing the jail ministry, I noticed that the inmates would want their greens to be neat and pleated. They “ironed” the pants by folding them and putting them under the mattress while they slept. Clothing made the man. The Bible tells us what we are to clothe ourselves everyday. I’m not sure what I will wear for Sonshine’s Rodeo Day – maybe some Wrangler’s, a George Strait shirt, Lucchese Boots, and a Resistol Hat. Until then, I plan to dress according to Colossians 3. If we daily don the apparel of compassion, kindness, humility, gentleness, patience, and then secure them with the belt of love we would truly be dressed to the nines. I attended Mrs. Ruby’s funeral on Saturday. My head and my heart were filled precious memories. As she was eulogized, I learned more about her faith. I had witnessed it when she came to work. Mrs. Ruby was the custodian at Parkway where I had been principal. She was a very important part of the Parkway Family. Everyday when she arrived she would peek her head in my office and speak. She would compliment me on my ties. She would sometimes have a plate of fresh grown and cooked vegetables from her garden. She and Mr. Stovall were proud of their garden. She would ask if I like greens, and I would tell that I loved them and especially if they were already cooked. She would smile. When we had snacks during the day, I always tried to save something for Mrs. Ruby. She would tell me you are so nice. She was so dedicated to her job and I would get so upset when the boy’s bathroom would like a war zone and she would have to do extra work cleaning it. She didn’t complain. I have some precious memories of Mrs. Ruby! Mrs. Edwards and Ms. Jaime kept telling me that Mrs. Ruby asked about you. Mrs. Ruby said to tell you hello. Right before Christmas, I posted on Facebook, “Will someone please tell Mrs. Ruby I said hello?” Thank you Ms. Jaime for telling her. See, the last time I saw Mrs. Ruby was as she laid in the casket. My memories are more than that viewing, because of the life she lived. I saw her live and practice the talk she would hear on Sunday’s. She walked the talk. She was kind and generous. She tried to do right, therefore her memory is a blessing to me. Yesterday, Dr. Ethan Brown, LCU Professor, preached from this text. His message was exceptional and filled with the Holy Spirit. The LORD spoke through him - sharing this passage with the congregation. It was on my mind when I went bed last night and the first thing I thought about this morning when I woke up. Steadfast, what is steadfast that is in our lives? Our jobs? Our families? Our relationships? 1. fixed in direction; steadily directed: a steadfast gaze. 2. firm in purpose, resolution, faith, attachment, etc., as a person: a steadfast friend. 3. unwavering, as resolution, faith, adherence, etc. 4. firmly established, as an institution or a state of affairs. 5. firmly fixed in place or position. Think about God’s love for us! He is steadfast and His mercies never stop. His love is unwavering, fixed on us, and refreshed daily. Those poor Dallas Cowboys….is our relationship with them steadfast? There are a few die-hard fans, but most of us get upset and find another “winning” team to support, so our relationship is based on a condition. Thank God, His love is not like that. Even when we mess up, He still loves us. When the world around us is crashing – His love is steadfast and gives us hope. When disaster hits – His love is steadfast and gives us hope. When we are broken – His love is steadfast and gives us hope. When a relationship goes awry, a job is lost, or someone disappoints us – His love is steadfast and gives us hope. As we start a New Year, 2012, let’s remain steadfast in the fact that God loves us. His love for us will never waiver, and because of that – we have hope for 2012 . It’s a long story - beginning years ago. Remember the first day of school when the teacher would call you by your proper first name? “Edwin, are you present?” Hated it! I was named after my dad’s brother that had died before my birth. I learned that my name meant “rich friend.” Right! I still hated that name as a child. As my nieces grew, Amy, Sarah, and Leah decided upon “Edweiner.” No girls, that won’t work – we can say Ween. Thus, it is Uncle Ween or Tío Ween. Love it! Over my teaching career the name Fitzgerald has been a challenge for some. I once received a letter from a parent of a student addressed to “Mr. FrenchGeneral.” I am not lying, saved the letter. I was often called Mr. Fritz, Mr. Fish, and Mr. French. Finally, I settled on letting students call me Mr. Fitz. As a principal, I was called other names that are not printable. I’ve been thinking about names. Many of my friends are grandparents and have chosen special names other than grandma, granny, and grandpa. There is something special about a name. What comes to mind when you hear someone’s name? Edwin identifies me, but it doesn’t tell anyone about me. There is a name that should tell others about us and that is the name Jesus gives us when we accept Him as our Savior and Redeemer. Christian – it let’s others know that we are identified with Christ. The Bible tells us that we will have a new name, it will be written on a white stone, and it will never get blotted out from the book of life. Our name will be acknowledged before God the Father and His angels. What is your name? Is it written in the Lamb’s Book of Life? Do you know the man named Jesus? Holy and Almighty Father in Heaven, thank you for your sending your Son, Jesus Christ, to redeem us and allow us to be called your children. Thank you for your faithful love, mercy, grace, and blood of Jesus that cleanses us when we, your children, fail. For the Holy Spirit that gently leads us, I thank you. Cover us, your children, with that Holy Spirit so as we live each day we bring honor and glory to the name of Christ. Humbly asked through the precious name of Jesus, Amen.